Posted in News and tagged America East, Facebook on May 3, 2016 by Brandon Costa. The Sports Video Group is pleased to announce an exciting pair of keynote speakers for the 2016 SVG College Sports Summit (June 1-3, Omni Hotel at CNN Center, Atlanta). 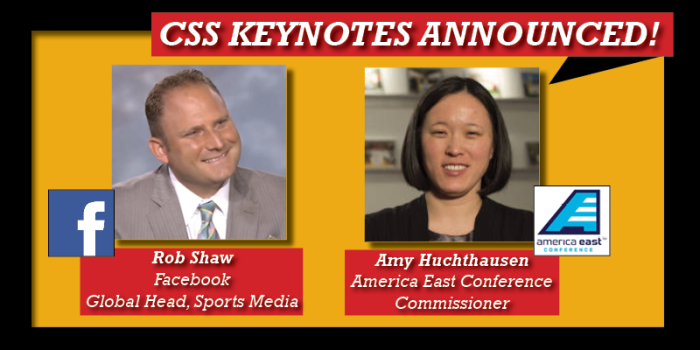 Robert Shaw, Global Sports Media Partnerships at Facebook will take the main stage on Thursday, June 2, while Amy Huchthausen, Commissioner of the America East Conference will address the Summit on Friday, June 3. At Facebook, Shaw works with partners worldwide to best utilize the Facebook strategy to achieve broadcast and publishing strategies. At CSS, Shaw will share some of the latest developments at the social media juggernaut and share his advice for how to best utilize the platform to engage fans and alumni in the college sports space. Huchthausen is in her fifth year as commissioner of the America East Conference. She will share strategies in the digital work for a mid major conference and its member institutions. She was named commissioner in September, 2011, becoming the conference’s fourth commissioner and first woman to lead the league. She was recently recognized as a 2016 Forty Under 40 honoree by Sports Business Journal after being named a Game Changer by the same publication in September, 2015. The SVG College Sports Summit is less than one month away. Don’t miss out on your chance to come and be a part of the largest professional development and technology conference dedicated exclusively to the college sports video industry. Unique and hyper-focused opportunity to meet with your peers facing the same challenges you do everyday. Book your hotel now while rooms last! This year’s event chairman Imry Halevi, Harvard University, Director of Multimedia & Production and the Advisory Committee have put together a fantastic program addressing key areas in content creation and distribution. If you have any questions regarding the event’s program and festivities, please don’t hesitate to reach out to SVG College Director Brandon Costa at brandon@sportsvideo.org. Any questions regarding hotel rooms or event registration, please contact Andrew Lippe at andrew@sportsvideo.org.